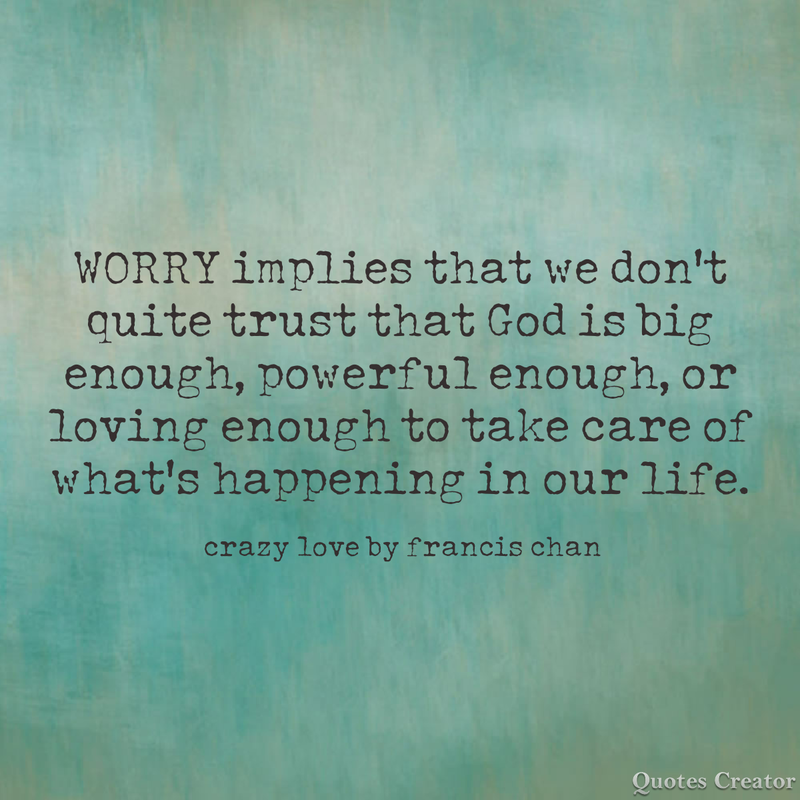 So, I have been reading this book called Crazy Love by Francis Chan. It was part of a course requirement for my husband’s one doctoral class – it caught my eye. So when he finished reading the book, I asked him if I could borrow it. WOW…my heart!!!! Since reading the book my soul has been greatly rebuked and challenged yet encouraged in the greatness of who God is and how much He so desires me — and YOU! Today, I’d love to jot down for you a few excerpts from Mr. Chan’s book from pages 41-45 [please note that all bold words within quotation marks are from Crazy Love]. My prayer for you is that through reading these thought provoking reminders they will both challenge and encourage your soul; make you honestly evaluate your own relationship with God; make you question who you ‘think’ God is – or realize if you have created your own idea of God and not truly see who God really is; and help bring your soul to the only place where it should go — bowed down; worshipping God because of who He is; because it belongs to Him, because of who I am – to be awe-struck just as I am. In other words, when consumed by my circumstances I say…that I have a “right” to disobey God because of the magnitude of my responsibilities…but in God’s eyes this thinking is wrong. Basically, these two behaviors communicate that it’s okay to sin and not trust God because the stuff in my life is somehow exceptional. Both worry and stress reek of arrogance. They declare our tendency to forget that we have been forgiven, that our lives here are brief, that we are headed to a place where we won’t be lonely, afraid, or hurt ever again, and that in the context of God’s strength, our problems are small indeed. First Corinthians 10:31 says, “So whether you eat or drink or whatever you do, do it all for the glory of God.” So what does this mean? Frankly, you need to get over yourself. It might sound harsh, but that’s seriously what it means. Maybe life’s pretty good for you right now, God has given you this good stuff so that you can show the world a person who enjoys blessings, but who is still totally obsessed with God. Or maybe life is tough right now, and everything feels like a struggle. God has allowed hard things in your life so you can show the world that your God is great and that knowing Him brings peace and joy, even when life is hard. [Isn’t God Good!?] Like the psalmist who wrote, “I saw the prosperity of the wicked… Surely in vain have I kept my heart pure… When I tried to understand all this it was oppressive to me till I entered the sanctuary of God” (Ps. 73:3; 13, 16-17). It is easy to become disillusioned with the circumstances of our lives compared to others’. But in the presence of God, He gives us a deeper peace and joy that transcends it all. “Many of us want a ‘religion’ but don’t want a ‘Christianity’ that touches our lives.” [Pastor Bob Loggans] “We want the world and Jesus too – it doesn’t work that way. We cannot have them both.” [Pastor Richard Woodruff] I have such great pastors — so blessed & thankful!! Folks, we have got to decide!